Sam-Son Farm began their foray into racing in 1972 when founder Ernie Samuel asked trainer Art Warner to claim a chestnut three year old filly named Takaring from a race at Fort Erie. Takaring would later win the Bison City Stakes and the Wonder Where Stakes, the final two thirds of the Canadian Triple Tiara for fillies, and thus set into motion the ascent by the stable toward consistent excellence on North American race tracks. Later in the year Samuel would purchase a pair of yearling fillies at the CTHS annual sale that later became foundation mares for the soon to be powerful stable. One of the yearling fillies was a locally bred daughter of Nodouble – Classy Quillo which Samuel paid $25,000 for. He gave her the name No Class, which in time would become a name that was one hundred and eighty degree turn around from her actual importance to the racing/breeding scene. No Class won only three races from twenty-nine starts, but was stakes placed twice in a pair of important events. However once she became a broodmare, No Class was all class by producing eight foals of which six won stakes races, four of which becoming champions. No Class is the head of a powerful and prestigious family, and is acclaimed as perhaps the most important broodmare in Canadian racing. 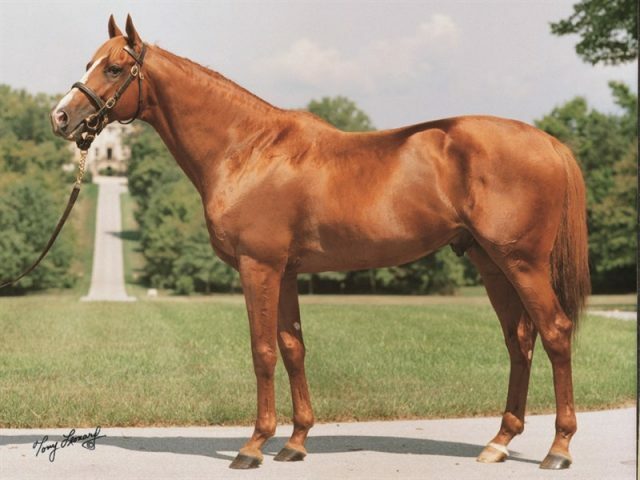 Among her four champion offspring was a big beautiful chestnut son sired by Canadian bred English Triple Crown winner Nijinsky II. The colt was born in 1987 on the Sam-Son farm in Milton, Ontario and was named Sky Classic. He was the fifth foal produced by No Class and became the fourth consecutive champion, and what a memorable champion he was! Sky Classic was trained by Jim Day, who knew the Samuels from his days as a world class Equestrian rider. Day rode many horses in world Show Jumping events that were owned by Ernie Samuel, including Canadian Club when Day was a key member of the 1968 Olympic gold medal winning team in Mexico. Day became the private trainer to Sam-Son in 1978. Having already campaigned three prior champions from the No Class family, Day and Samuel entered Sky Classic in the Clarendon Stakes for his first race. The colt had been training positively and showed he could be another special race horse in his morning sessions. Sky Classic, under legendary jockey Sandy Hawley, finished second by a length and three quarters to Ever Steady in the five and one half furlong tilt. A month later he came closer to Ever Steady in the Vandal Stakes, but was still second best by a nose. Staying at Woodbine, Sky Classic ran in a seven furlong maiden special weight race and won by five lengths. The race was contested on the turf course, and a scenario of future success would begin. Sky Classic glided over the grass gracefully and with complete ease. Three weeks later the Sam-Son colt became a stakes winner when he captured the graded Summer Stakes on the same course, at a distance of one mile. The longer the races became, the better Sky Classic became. Sky Classic made it three in a row with a dominating ten lengths victory in the Cup and Saucer Stakes at eight and a half furlongs and then completed his juvenile campaign with a convincing three and a half win in the graded Grey Stakes on the dirt. Sky Classic was named as the Sovereign Award Champion Two Year Old for 1989. The future looked very promising for the colt. Sometimes however promising has to wait. Sky Classic had an abbreviated three year old season in which he battled a serious injury to a hind leg that kept him away from training for many months of the year. Once he was deemed fit and sound, Sky Classic raced five times. The injury and the lay-off took much out of him, and Sky Classic did not win a race in five starts on the year. He finished third in an allowance race at one mile on a yielding Woodbine turf course and then was out of the money in the twelve furlong Niagara Handicap. The Sam-Son colt was showing progress despite his results and entered the Canadian International to face many of the elite grass runners in the world. Sky Classic put in a remarkable performance to finish second in the grade one event, his first G1 race, to Juddmonte Farm’s regally bred French Glory. The performance was encouraging enough to send Sky Classic to Belmont for the Breeder’s Cup Turf. The race was a disaster however as Sky Classic retreated to a career worse eleventh place finish. The race was won by In The Wings, with Canadian Triple Crown champion With Approval a half length behind in second. Sky Classic made one more unplaced start to complete the year. He went to Sam-Son’s Florida training facility to prepare for his next season of racing. Two more unplaced races led off his four year old campaign, before Sky Classic began to put it all together. His regular rider now was Pat Day, no relation to Jim. Pat Day and the big rangy chestnut began a six race win streak with a brave victory in an allowance race at Churchill downs in which he was mugged along the back stretch. Sky Classic overcame this to win going away. It was if a light bulb went off as Sky Classic continued to improve to capture the Connaught Cup, King Edward Gold Cup, Canadian Maturity and Seagram Cup in dominating fashion. Next up was the Canadian International, and a chance to become the first Canadian horse since He’s A Smoothie in 1967 to win the important world class event for the home crowd at Woodbine. The locals were confident and made him the 3/5 favourite. Sky Classic broke alertly and settled in a stalking position in third at the first call. He later glided to the front along the back stretch and never looked back. Pat Day let him dictate the race for a comfortable length victory over Panoramic and stable mate Tot Of Rum. He set a new course record in the process. Finally after twenty-four years of watching the elite of the racing world capture the rich race, a Canadian was in the winner’s circle. Now you would think that such an accomplishment made Sky Classic the most talked about superstar of Canadian race fans. But 1991 was also the year Sky Classic’s stable mate Dance Smartly was stealing all of the thunder. She had won the Canadian Triple Crown and the Molson Million against some of the best three year olds on the continent. Dance Smartly was a daughter of Sky Classic’s half sister Classy ‘N Smart, so it was his niece that took away his potential press headlines. Nevertheless, both Sam-Son champions would be going to the Breeder’s Cup at Churchill Downs for a shot at becoming the first Canadian bred horse to win in the annual racing extravaganza. While Dance Smartly won her event, the BC Distaff, to capture the hearts of all fans in Canada and the U.S., Sky Classic could not complete his task in the BC Turf and finished fourth. He led through the first ten furlongs in the twelve furlong event, but weakened in the stretch. He earned two Sovereign Awards as Canadian Champion Turf Horse and as the Champion Older Horse. Sky Classic was so close to winning an Eclipse Award, like his niece had done, that Sam-Son kept him in training for his five year old season. He would race exclusively in the U.S. and travelled around the country seeking to engage the top turf horses in training. After another winter spent in Florida, Sky Classic returned to the races for a pair of graded races in Kentucky. Another similarity came about as Sky Classic also lost his first two races just as he had a year before. Going to Pimlico for the May 15 Dixie Handicap, the champion found his winning form with a driving half length victory over the classy Fourstars Allstar. Three weeks later he won the Manhattan Handicap on a deep soggy Belmont turf course when he had to check at the top of the home stretch and overcome that obstacle. Travelling to Atlantic City two weeks later, Sky Classic captured the Caesar’s International Handicap and earned a short rest. Jim Day returned Sky Classic to the races for the Arlington Handicap eight weeks later as a tune up for the lucrative Arlington Million. The big chestnut won the tune up in workman like fashion, covering the grass course in 2.00 3/5. In the big event however, Sky Classic was just nailed at the wire by Dear Doctor to deny the Canadian the laurels. That loss notwithstanding, Sky Classic was being touted as the early favourite for the Breeder’s Cup and was the pro term leader in the division. The Sam-Son team led by Day and Day brought Sky Classic back to Belmont for the Turf Classic Invitational. In the opinion of many, this race may have been Sky Classic’s finest performance. He pulled away from a very classy and deep field to win by one and three quarters of a length over Fraise and Solar Splendor in a time of 2.24 2/5, a new course record. His 110 Beyer rating was the best of the year at twelve furlongs. He was ready and at the top of his form for his next event, the Breeder’s Cup Turf to be held at Gulfstream Park. As usual, the BC Turf attracted the elite twelve furlong horses from around d the world. The race would go two fifths of a second quicker than the previous race and Sky Classic was right there at the wire. Unfortunately so was Fraise who got his nose in front when the picture was taken. It was an agonising defeat to say the least. Fraise found room along the inside hedge and engaged Sky Classic to win the head bob at the wire. Among the vanquished in the field were Epsom Derby winner Quest For Fame in third and Prix de l’Arc de Triomphe winner Subotica who could not keep up and finished unplaced. Despite the narrow defeat, Sky Classic achieved his mission in that he won the Eclipse Award as the best turf horse in America. He did not win a Sovereign Award in his native country however because he did not start a race in Canada, thus excluding him from consideration. The rule had prevented Canadian bred Sunny’s Halo who had won the Kentucky Derby from a Sovereign Award nine years prior. Sam-Son was besieged with offers from many top class breeding farms and syndicates to stand Sky Classic for stud. Being a multiple champion son of the great race horse and sire Nijinsky II and from a top class family, Sky Classic made for a tantalising stallion prospect. It was announced that Sky Classic and his stable mate Rainbows For Life would both be standing at Pin Oak Stud in Kentucky. Rainbows For Life was another well bred Canadian champion from the Sam-Son breeding juggernaut and carried a world class pedigree. He would race for one more year, but went instead to Ireland for breeding, while Sky Classic moved into his new stall at Pin Oak in time for the 1993 breeding season. Sky Classic became a very successful, but underappreciated stallion. His get tended to mature slower than what most yearling buyers were looking for, so he was not a commercial success in regard to his offspring selling on the yearling sales market. Smart breeders however could see the quality in his foals, and Sky Classic was a consistent source for durable honest race horses. He had some good two year olds, such as juvenile grade one winner Certainly Classic, but generally his sons and daughters got better with maturity. Among the best of Sky Classic’s progeny include a pair of Canadian champions in Thornfield who won the Canadian International just as his sire had done, and Sky Conqueror a two times winner of the Northern Dancer Turf Stakes as well as the Woodford Reserve Turf Classic. Prestonwood Farm’s consistent performer Hyperbaric won the Citation Handicap and Oak Tree Mile. Additional major stakes winners include Nothing To Lose, Magnetic Eyes, Miracle Painting, Sur La Tete, Texas Gal, One Emotion and Abraham Classic. The daughters of Sky Classic are now producing world class stakes winners such as 1000 Guineas winner Speciosa and Matriarch Stakes winner La Tia. There are many young daughters of Sky Classic still in breeding so his forty-three stakes winners as a broodmare sire number will certainly rise over the next few years. Sky Classic sired fifty-nine stakes winners when he retired from nineteen years of breeding in 2015. Ten of these stakes winners won at the grade/group one level. There may be more of his offspring to enter the winner’s circle of a stakes race since his get tend to develop with maturity and his last crop of foals were born only two years before time of writing. The big handsome chestnut with the flaxen mane and tail passed away peacefully in his paddock at Pin Oak later that same year. Sky Classic was a quiet easy going horse and had many admirers during his twenty-eight years of life. He was cremated and his ashes are now interred in a beautiful spot near Dance Smartly’s grave at Sam-Son Farm. Sky Classic may be the best Canadian bred horse to have raced in his own country and never win a Sovereign Award as Horse of the Year. That should not take away from the fact that he was in every sense a great horse. He was bred from equine royalty, competed hard, overcame injury, and made headlines in the shadow of a legend. Sky Classic was a successful sire and has made a contribution to further the breed. He is a bona fide Canadian legend on every level. Sky Classic is a member of the Canadian Racing Hall of Fame, and there is a grade two turf race run annually at Woodbine in his honour. There are legends that are obvious, and those that are not. Talk to anyone who saw Sky Classic race and admired his handsome looks. They will tell you that Sky Classic was a classic. He was a multiple champion who raced in the highest class of competition. 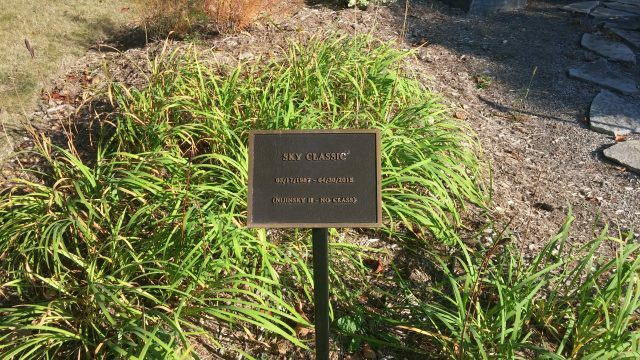 Unlike his mother’s inappropriate name, Sky Classic was named perfectly. A very under appreciated sire. A very under appreciated sire and broodmare sire in my humble opinion. This portrait of Sky Classic by Tony Leonard was the photo that always stood out for me when browsing the new stallion directory every year. Working in Kentucky I was fortunate to visit Sky Classic a few times at Pin Oak and witness his presence in the flesh.